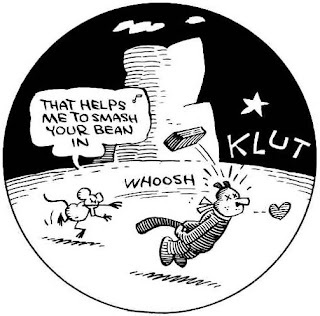 I just learned a minute ago that "A Fire Story" has been nominated for a 2018 Ignatz Award for Outstanding Online Comic by the Small Press Expo (SPX). SPX is the largest fest of its kind in the U.S. and a major showcase for independent, alternative comic voices. It's a nice honor. NOTE: Anybody following a link to this post can read "A Fire Story" here. Thanks! EDITED TO ADD (Sept. 15): Didn't win. 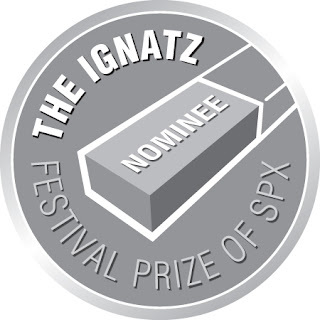 Still very nice to be nominated! Could also still use a brick. I turned in my final digital files for the book-length "Fire Story" yesterday. Abrams works fast--they had the book laid out and on its way to the printer by the end of the day. I'll have one more opportunity to make small corrections when I get proofs (pages as they'll actually appear in print), but the book I turned in is more or less the one that'll be published next March. Abrams seems to think we've got a winner, and is giving it unprecedented (for me) support. I'm of course anxious but also sanguine; there's nothing I could have done to make it any better, so no regrets whatever happens. 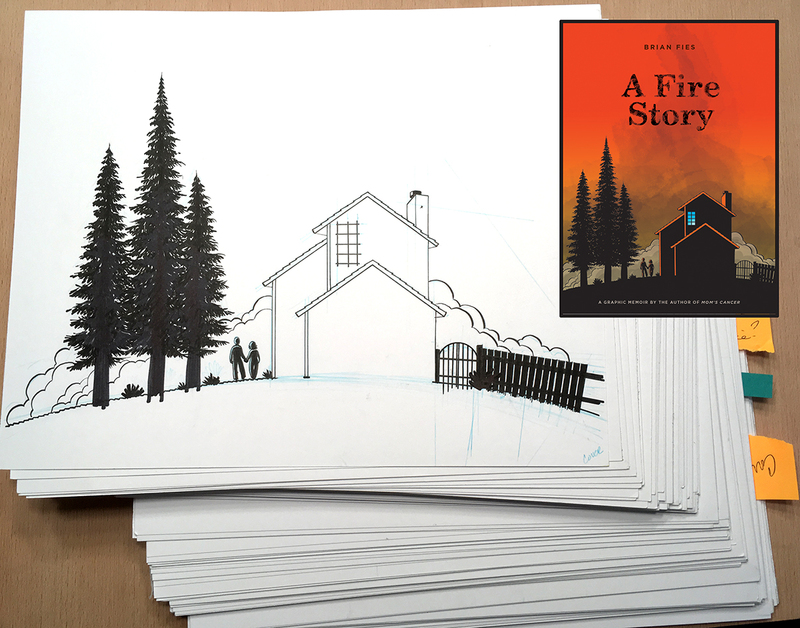 The photo shows a 150-page stack of hand-drawn artwork, topped by the drawing I did for the cover (inset). These are all ink on 11 x 14 inch Bristol board. In the age of Photoshop, there's often a big difference between original and published art. No need for me to waste a bottle of ink filling in all those black areas when I can do it later with the push of a button. New ways are practical and efficient, but sometimes I miss the old ways, and there are pages on which I did more work than necessary just because I wanted to create a pretty piece of art. 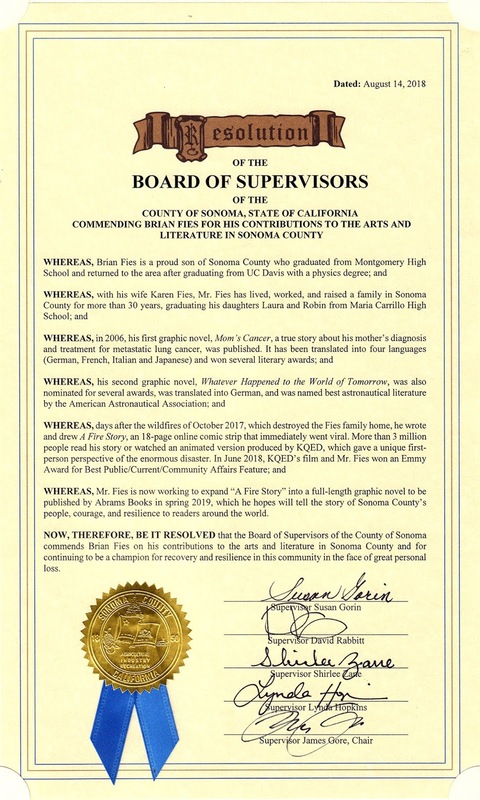 I received a very nice honor this afternoon, a Gold Resolution from the Sonoma County Board of Supervisors for my "contributions to the arts and literature" of the county, specifically "A Fire Story." It's a "key to the city" kinda thing except no keys exchanged hands. What was especially nice was that the supervisors genuinely appreciated my work and were very happy to recognize me for it. Smiles, handshakes, and quiet words of encouragement all around. Karen made me bring the Emmy. It got a good laugh when Chairman James Gore read that part of the citation and I pulled it out of a bag and thumped it down on the lectern. Karen got a Gold Resolution years ago for her superior service to the county, which makes us a rare (unique?) spousal "his-and-her" GR double-threat. I really appreciated this. It means a lot coming from your own hometown. Sonoma County supervisors Lynda Hopkins, David Rabbitt (top), James Gore, and Susan Gorin (who also lost her house in the fire), with Karen and me. Supervisor Shirlee Zane was absent today. Like I said, Karen made me bring the bling, which everyone had fun passing around.